A recent visit to the College of Nanoscale Science and Engineering (CNSE) at SUNY Albany inspired a few new DNA ideas that I decided would be greatly simplified by having NAMOT available again for design. Having failed at the base install of the NAMOT 2 version and, unfortunately, not having NAMOT available in Fink for a simple installation, the solution became to build the pre-release from scratch. Ignoring the many errors one encounters while walking through an OSX/Xcode/Fink/X11 bootstrap, the final procedure worked well and without major problem. As usual, the error messages at varied steps are provided below because, I assume, those messages are what you’re searching for when you find your way here. You’ll need the following installed for this particular build. I believe XCode is the only thing that you’ll have to pay for (if you don’t already have it. I seem to remember paying $5 through the App Store). The GNU Scientific (C and C++) Libraries – www.gnu.org/software/gsl. This will be installed with Fink. 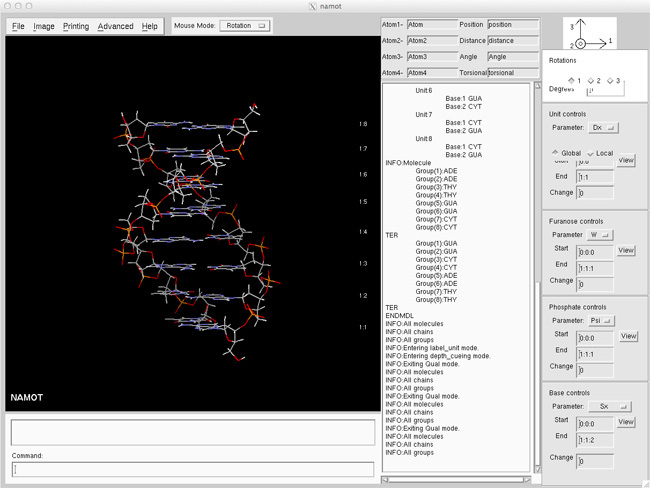 An OSF/Motif clone (made available for OSX through Fink) – lesstif.sourceforge.net. This will be installed with Fink. The -pre4 is currently available (from 2003) from sourceforge.net/projects/namot/files/. I did not try -pre3 and had no luck with the official 2 release. Blindly follow the install procedure. Several steps below deal with working around the default install locations (specifically, /sw). Blindly follow the XQuartz install process. After the installations, you’ll receive the same error as above. The –x-libraries= and –x-includes= additions to configure below direct the script to the proper libraries and includes. Hopefully, you’ll find yourself past the first install problem and onto the second problem. The next two codes that need to be installed are the GNU Scientific Libraries and LessTif, both of which are much easier to install using Fink. It is generally useful for many other codes as well, so a good program for any computational chemist to have on hand. The install should be non-problematic despite having to build it from source in 10.6 – 10.8 (as of January 2013). If you build with all the default settings, you’ll have no trouble after. I chose the default settings throughout. You should now have a working Fink installation in '/sw'. You still need package descriptions if you want to compile packages yourself. You can get them by running either of the commands: 'fink selfupdate-rsync', to update via rsync (generally preferred); or 'fink selfupdate-cvs', to update via CVS (more likely to work through a firewall). Run '. /sw/bin/init.sh' to set up this terminal session environment to use Fink. To make the software installed by Fink available in all of your future terminal shells, add '. /sw/bin/init.sh' to the init script '.profile' or '.bash_profile' in your home directory. The program /sw/bin/pathsetup.sh can help with this. Enjoy. Which will produce the following two pop-ups notifying you of shell modifications. Information about 305 packages read in 0 seconds. no package found for "gsl"
Failed: no package found for specification 'gsl'! Required after the installation is a fink selfupdate. fink needs you to choose a SelfUpdateMethod. Updating the list of locally available binary packages. Which then leads to a successful GSL install. Information about 12051 packages read in 1 seconds. The package 'gsl' will be built and installed. As mentioned above, there are a few redirects that need to be made after the XCode / Fink install to put libraries and includes where, in this case, NAMOT expects them. To perform this task, we’ll be using symbolic links. Gets you past the GSL issue. The LessTif symbolic links work the same as the GSL symbolic links. This fink install may take a while. The package 'lesstif' will be built and installed. But, unfortunately, the LessTif libraries are not in the expected locations. NOTE: The make step with Python 2.6 produces the following error below. I did not diagnose this beyond the failure to build under 10.6. OSX 10.8 comes with Python 2.7, which did not produce this problem (I’m assuming this is the origin of the problem). …will produce the following error at the pngwriter.c step. The build on 10.8 continues as below, with a few warnings about the symbolic link usage that do not seem to affect the program usability (or continued build). *** Warning: linker path does not have real file for library -lXm. *** Warning: linker path does not have real file for library -lgsl. *** Warning: linker path does not have real file for library -lgslcblas. *** application is linked with the -dlopen flag. With luck, your launching of NAMOT will open XQuartz and produce a fully operational NAMOT session. And, for more assistance with producing DNA files for GROMACS, consider the Modifications To The ffG53a6.rtp And ffG53a5.rtp Residue Topology Files Required For Using GROMOS96-NAMOT-GROMACS v1, sed-Based Script For Converting NAMOT And NAMOT2 DNA Output To GROMOS96 Format For GROMACS Topology Generation v1, and sed-Based Script For Converting NAMOT And NAMOT2 DNA Output To ffAMBER Format For GROMACS Topology Generation v1 pages on this blog.